Records it here in hearts, in life above. Between 1914 and 1918 the oak tower screen was put up in memory of Private Geoffrey Coles killed in action in 1915. The tower arch was screened in 1990 and a room provided in the tower in memory of a much loved rector, Fr Cecil Vaughan Lawson. 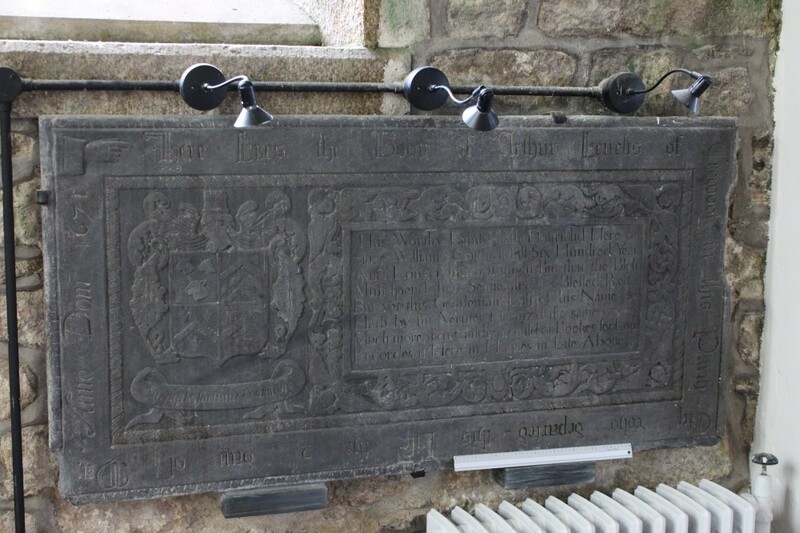 Dedicated to the memory of GEORGE LUGG late of the parish of St Just. He died ye 5th of March 1819 aged 48 years. Long did he suffer here below, Death came and eas’d his pain, And took him from a world of woe To pleasure, joy and gain. In memory of ELIZABETH MARY, the beloved daughter of EDWARD and MARY MILDRED, who died at St Buryan on the 22nd of August 1882. Here lyes the body of ARTHUR LEVELIS of Trewoof in this parish, who departed this life the 2nd day of May Anno Dom. 1671. This worthy family hath flourished here Since William’s conquest six hundred year, And longer much it might, but that the blest Must spend their seavenths in a blessed rest, But yet this gentle man, last of his name, Hath by his virtues eternized the same, Much more than children could on books for love, Records it here in hearts, in life above. The tower screen was erected by the members of his family in loving memory of GEOFFREY HORSMAN COLES of Little Swingate, Sennen, who was killed in action in France on 27th January 1916 in his 45th year, while serving as a private in the 24th Royal Fusiliers. His life for his country, his soul to GOD. Tomb: CLARICE: la: femme: CHEFFREI: DE: BOLLEIT: cit: ici: dev: de: larme: eit: merce: pur: lealme: punt: di: ior: ioe: pardym; averund. Translated : CLARICE the wife of GEOFFREY DE BOLLEIT lies here, God of her soul have mercym who pray for her soul shall have ten days pardon. In loving memory of BENJAMIN EASTLAKE LEADER Captain Queen’s Regiment, who fell in action on the Somme October 12th 1916 aged 39 years. There is music in the midst of desolation, and a glory that shines upon our tears. To the glory of God and in the memory of 123 men from this parish who served with His Majesty’s Forces in the Great War 1914 – 1918, and in proud and loving memory of these who laid down their lives. The chancel screen was completed in this church of St Buryan AD 1922. To the greater glory of God Amen. This altar and reredos are erected by parishioners and friends to the memory of RICHARD JAMES MARTYN MA, priest, Hon Canon of Truro Cathedral and Rector of this Parish 1882 – 1913. CHRISTOPHER BENSON CROFTS FSA, Missionary in West Indies 1907-1923, Curate of Bideford 1923 – 1926, Rector of this Parish 1926 – 1955. RIP. In memory of ROBERT EDMUND TONKIN 1850 – 1935 OF Treverven in this Parish. This panelling was erected by his nephew JOHN FRANKLIN TONKIN 1956. In memory of NEVILLE W MARTYN Midshipman of HMS Inflexible, who died at Malta Jan 2nd 1892. This tablet is erected by his fellow Midshipmen as a mark of their deep regret. The lighting of this church is given in loving memory of their parents by the sons and daughters of THOMAS GWENNAP and of JANE his wife, both of whom passed to their rest on the 26th August 1936. In loving memory of RICHARD PERCY HENRY MARTYN who died July 2nd 1911 at Indanugger Sydnet, India aged 37 years. To the glory of God and in loving memory of CHARLES DACRES SEVAN aged 67 years, who departed this life June 24th 1872. To the glory of God and in loving memory of THOMAS BORLASE COULSON, Priest and Rector of this parish 1864 to 1882, this window is dedicated by his widow and children Anno Dom 1897. To the glory of God and to perpetuate the memory of JAMES PERMEWAN DIED 3RD July 1842 aged 56 years; CHARITY PERMEWAN died 21st July 1857 aged 77 years; father and mother of JANE STEVENS who died Dec 19th 1909 aged 94 years; also JAMES PERMEWAN died 29th March 1863 aged 45 years; JOHN STEVENS PERMEWAN died 15th Feb 1870 aged 51 years; brothers of the above JANE STEVENS; also JAMES PERMEWAN died Feb 24th 1836 aged 92 years; great uncle of JAMES and JOHN PERMEWAN and of JANE STEVENS by whom this window is dedicated AD 1910. Pulpit: JOHN HOSKIN offered this pulpit to the glory of God and in memory of his family AD 1905. Hymn Board: To the praise of God and in loving memory of ARTHUR CECIL JAMES died in Mexico City Sept 21st 1909 aged 25 years. Sanctus Bell: In memory of our parents ABNER and ADA GRENFELL, Whitsuntide 1975.